Cash Formula is a relatively new binary trading software, and it’s as sinister as the scams that came before it. Yes, Cash Formula is a scam, and we have the evidence to prove our case. 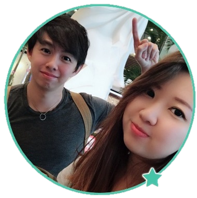 Read our in-depth Cash Formula review for more details. When we received multiple alerts from our readers who lost all their deposits to Cash Formula software, we knew we have a scam to deal with. The co-founder of Cash Formula, Tim Stafford claims that his software is the only legitimate auto-trader out there, while simultaneously revealing and bashing other binary trading software scams such as Fast Cash Biz. While we agree that these scams are unscrupulous, it doesn’t make Tim Stafford’s software more legitimate than the others. In fact, Cash Formula scam follows exactly the same path as its predecessors – by generating empty hypes and fake promises in the sales video. As we delve into the review, let’s dissect the lies told by Tim to deceive you into paying for the scam. Throughout the sales video, and in the FAQ section, you are promised to make an average of $10,000 a day, as long as you keep the software running. There is nothing much you need to do. You just have to sign up for it, fund your trading account, and turn on the auto-trading feature. Then, according to Tim Stafford, you will enjoy your new-found financial freedom, where you make more money in a day than most people make in a month. Well, these promises are just blatant lies made by Tim to trick you into funding your trading account, where it will be siphoned away through a series of “losing trades”. There’s no free lunch in this world, so don’t buy into scams that promises to make you huge profits with no work at all. No amount of proof is more powerful than their own legal disclaimer, so we decided to reveal this piece of evidence first. You can’t find the document anywhere within their sales material, because it is supposed to be hidden from you. However, they have to reveal the true nature of the scam somewhere in the website, or they may face legal actions when the victims decide to sue them. Therefore, they chose to hide the truth deep within the disclaimer, which can only be found through a fine print that reads “earnings disclaimer” at the bottom of their sales page. 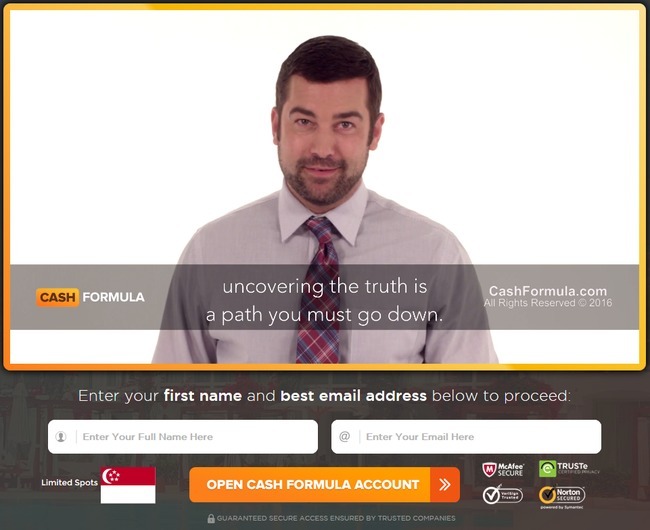 You can authenticate our claim by accessing the document at their own website: cashformula.com/disclaimer. Any and all forward looking statements here or any of our sales material are intended to express our opinion of earnings potential. Self explanatory – despite giving you multiple promises, Cash Formula denies their guarantees using their disclaimer. Even though Cash Formula is advertised as a one-click auto-trading software that handles everything for you, somehow your earning potential is entirely dependent on your own techniques. This is important – all the profits and earnings shown in the sales materials are intended to express the scammers’ opinion of earnings potential for the system. In other words, none of the earnings shown are real! Once again, Cash Formula scam retracts the guarantee they have given to you in the sales materials. Unfortunately, vast majority of the victims don’t even realize the truth when they sign up for the scam. The scam generates a lot of empty hypes and fake guarantees in the sales materials so that people will sign up and fund their accounts. At the same time, they deny any of the guarantees they have made using the terms and conditions hidden in a disclaimer that no one will read. And when you lose all your trading fund with the software, you can’t even sue them because they have revealed the nature of the scam within the website (albeit hidden). 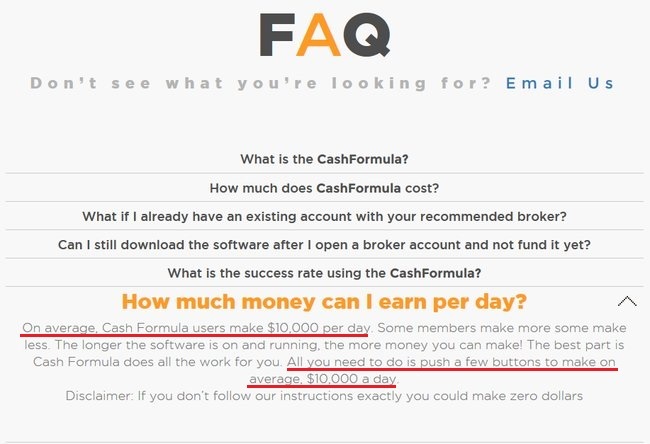 How Does Cash Formula Scam Make Money Off You? Have you wondered you can’t use your existing account with Cash Formula? If you decide to sign up for Cash Formula scam, you will have to register for a broker account using the registration form in their website. The form is actually an affiliate link, and the scammers behind Cash Formula scam earn a sum of handsome referral fees from the broker once you deposit into your trading account. Even if you already have an existing account with their recommended broker, you still have to register for a brand new account using a different email address. This is because the scammers cannot earn their referral fees from the brokers unless they refer a brand new customer in the form of new trading account. This is also why you are rushed to deposit at least $250 as soon as you sign up. This is their way of ensuring that they earn the referral fees. As for the brokers, they profit when you lose money in binary options. Unlike stock brokers, they don’t take trading commissions, instead they profit from your losses. In the end, Formula Cash scam gets their handsome referral fees, the brokers get your generous deposits, and you are left as the only loser in this whole deal. CASH FORMULA IS A SCAM. We strongly advise you to stay away from the scam if you don’t want to lose your hard-earned money. Binary Trust Method Review – Avoid the Scam! Oh my god, this review was truly eye-opening! I didn’t know there’s so much deceit going on behind the scene! Be extra careful if you come across that sounds too good to be true – there’s usually a catch hidden somewhere. Stay safe!